Our earliest nesters may begin hatching this week so stay tuned for the news! When the chicks first hatch, we cannot see them as they do not stand up and move around much. We must watch the adults behaviors for clues. During incubation, the sitting bird has its attention focused outward most of the time...watching other birds, snoozing, only occasionally poking around in the nest cup, rolling the eggs. When the chicks begin to pip the shell, the adults can become restless, looking down a lot, getting up to peek into the nest cup. Often when the male comes, they both stare into the nest. The female may sit a bit higher. The confirmation comes when the adults begin feeding the chicks, ripping small bits off the fish and offering it into the nest cup. To some people, brooding looks just like incubating...so we have to observe more closely to catch the subtle signs that the chicks have begun hatching. When you have been watching this miraculous event as many years as I have, the signs are quite clear. It still thrills me after all these years! Well, I have not posted much in the past week. Incubation can be a boring time. I have used the time to try to get bands read...I have now identified 78 birds by their leg bands. There are a few left to go. Some are difficult to view, some males are scarce and females are hunkered down. I keep trying to catch the changing of the guard, when the males bring a fish for the female and he takes over the incubation duties...but my timing is not always right. I have seen at least six pairs of ospreys in the past week that are STILL not incubating. We are sliding past the window of opportunity now. When you add up a 38-39 day incubation period, 7.5-8 weeks until they fledge and at least a few weeks to learn to fish on their own, independent of their parents, you can see that chicks which hatch late have a poor chance of being adequately prepared to undertake their first migration in September. I am curious about why some pairs have not laid eggs. Some may have paired up with a female that is not sexually mature and is therefore not receptive to copulation attempts. ( Many females are unbanded so we do not know their ages). There may be other reasons for not laying eggs too...weather, nest removal that required extensive rebuilding, and some reasons we may not fully understand. We expected this rapidly growing reintroduced population of ospreys to level off at some point, but had no idea how that might look. Perhaps we will begin to see more non breeding pairs. We call these pairs "housekeepers". I can now say I have visited all known nests and read bands at most of them. There are a few birds that are testing my patience by keeping their legs hidden. They will not escape my prying eyes for long. I am happy that the two nests where males disappeared / died mid season last year have new banded males on them. I have been trying to read a band on one male who apparently LOVES to incubate. He sits for long periods, with the female perched nearby. I waited and waited and waited the other day...and when he finally got up and flew away, he came back in less than a minute with a stick, and pushed the female out of the way so he could sit down again. So interesting. They are all unique. It won't be long before hatching begins on some of the early nests! All you birders in the metro area, remember to keep watching for new nests and let me know about them so the research can be as complete as possible. There are only a few nests that have not laid eggs now. In most cases it is because it is a new pair (one or both birds are new to the territory), or a nest was removed over the winter and had to be rebuilt. I am still seeing extra ospreys interacting at many nests. 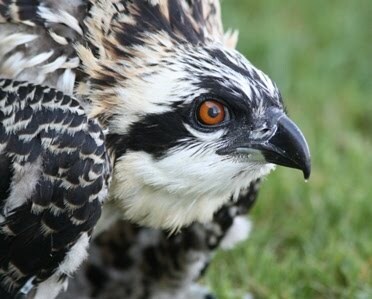 But this is normal since ospreys are semi colonial and our population is large enough for there to always be young birds around looking for a territory. I did observe a fairly aggressive attack a few days ago between two females...one of them had already laid eggs and I was worried that the eggs would be damaged by the attempts of one female to knock the other off the nest. Things did calm down when the male arrived...we will see if the eggs hatch. As many of you know now the arboretum birds on the cam are incubating and have two eggs so far. I spent some time watching a nest today where I still need to identify the male...but he would not get up from incubating! The female was walking around him and food begging for the 90 minutes I was there, trying to get him to stand up by getting very close and literally hollering in his face. Nope, he was comfortable. Some males really like to incubate, tho some seem nervous and can't wait for the female to take over. So interesting. I will have to try again to ID this male. The male who was on this nest earlier showed up at another nest so now I am wondering who this fellow is? I will figure it out. It's like putting the pieces of the puzzle together. Another day in the field yesterday...met with one of the new volunteers and toured a few nests. I am trying to meet with new volunteers that would like to spend some time in the field with me, so let me know if you are one of those people who would like to do that! Most nests are incubating now...a few are not. I am seeing fewer territorial fights. Things are oddly unsettled on a few nests. I observed one female who was dirty, muddy looking with a fish in her talons, and a male sitting next to her. When she flew off, he chased her, as if he was trying to get the fish! Hmmm. Not sure how that is going to work out. Some of the nests that are not yet sitting on eggs are the new couples...still working on the courtship thing, nest building. Even on nests that have been active in the past, there may be a new bird. They are still playing musical nests, so I am still running back and forth between nests to see who ended up winning the territory, re reading bands when necessary. New nests are popping up. Many bands read, but still many more to read. On some nests it takes so much patience...especially now that they are incubating. Males can be hard to find, females won't stand up and reveal their legs. Of course males incubate also, but the females don't go as far as males do when they are on their break...they are usually somewhere nearby. I always have trouble keeping up with correspondence this time of year...so forgive me if I forget to answer emails. Just remind me. It's important to get the data...keeping people posted is also important and I am doing my best, but it's a lot of work.